Black Clouds Above the L&N was taken from Basil Duke's History of Morgan's Cavalry which was published in 1867, and is written from Duke's perspective. 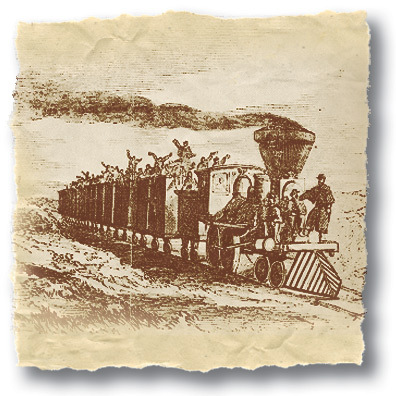 It focuses on two of John Hunt Morgan's raids on the Louisville & Nashville Railroad, the main supply line for Union-occupied Nashville and a favorite target of the Raiders. The first raid was on the L&N's twin tunnels above Gallatin, Tennessee. Morgan's men (along with some of the townspeople) piled crossties and chunks of wood across the tracks inside the south tunnel and sent a captured locomotive with a full head of steam plowing into the debris. The resulting explosion ignited a vein of coal in the tunnel's ceiling, closing it down for 98 days. A few days later, Morgan had to rescue the old men and young boys of Gallatin who were being marched to prison by the furious Yankees. The second raid was Morgan's infamous Christmas Raid of 1862 when he successfully captured and burned several L&N bridges and more important, the Muldraugh trestles. Next to the Gallatin tunnels, the trestles were the L&N's most strategic target, and by destroying them, Morgan shut down the supply line for five weeks. After the war, Duke practiced law and, ironically, became chief counsel and lobbyist for the L&N, which was attempting to establish itself as a monopoly throughout the South. Duke's reputation as a symbol of the Inner Lost Cause served the railroad well. Click here to listen to the song, Black Clouds Above the L&N.